Are you looking for the Best Pool Filters ever? There’s nothing like a swimming pool in the backyard for giving hours of fun for the whole family, whether it’s the kids splashing around with all their pool toys or the fitness conscious grown-ups swimming a mile before breakfast everyday. But one thing you really need to consider above almost everything else is clean water in your swimming pool. You need to make sure that the water is free from bacteria, viruses and all the assorted trash that can find its way into your pool, everything from bugs to leaves. 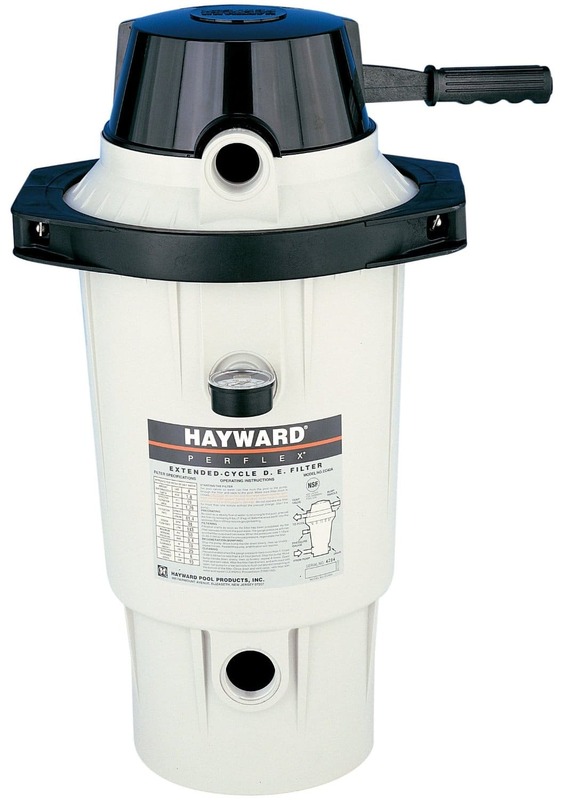 The Hayward S180T filter is one of the range of Pro Series top mount sand filters. It’s a high performance filter unit suitable for both above ground pools and in small ground pools. Highly efficient and low maintenance so you get the most from your swimming pool without having to spend too much time worrying about the quality of the water. The Hayward S180T sand filter is built to last with its tough polymer weather proof filter tank and efficient design it will give crystal clear swimming pool water with low maintenance and minimum fuss for years. You will only need normal hand tools like a screwdriver and wrenches to get your pool filter system fixed and running. Measuring 18 inches and only weighing 21 pounds it’s easy to handle. The filter system should be set no more than 6 feet above the pool water level on a level base. Naturally it’s a good idea to site the pump and filter well away from any pool ladders. Only use the correct grade of sand which is #20 grade silica sand. You will need 150 pounds of sand which you can get here. Filter: This is the setting for normal cleaning of the pool water and vacuuming. Backwash: When the sand in the filter is contains too much debris you use this setting to pump water back through the sand and clean it. Rinse: This operation follows the previous step it removes the dirty water. Re circulation: This allows you to bypass the filter altogether. Waste: With this setting you can bypass the filter to empty the pool, reduce the water level or vacuum large debris direct to the waste outlet. Winter: Just what it says, enables the shutting down and winterizing of the unit. Closed: completely isolates the filter from the pump. Always make sure you switch off the pool pump before changing the filter control valve setting! 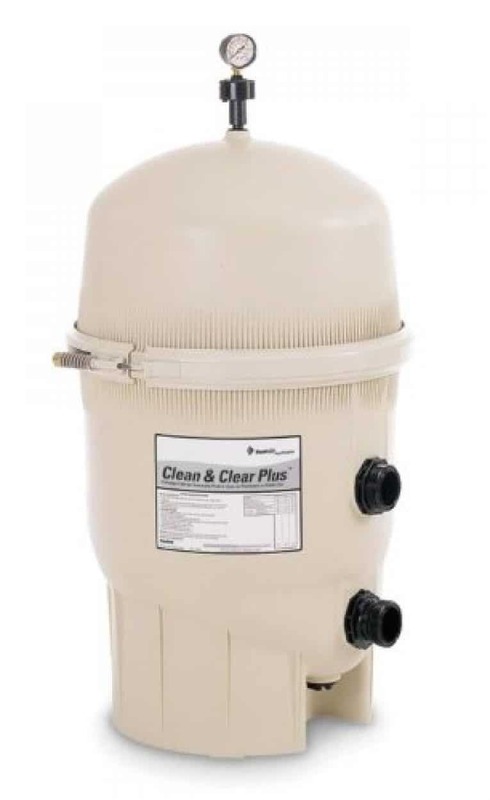 As this is a filter unit only you will also need a water pump, if you don’t already have one this Hayward Power-Flo Matrix above ground pool filter reviews will do the job. Remember that although filters will remove dead algae, you also need chemical control in the water to kill algae and ensure clean water. What Do Buyers Have To Say? The filter works great and the entire process of purchasing it to installing it exceeded my expectations! 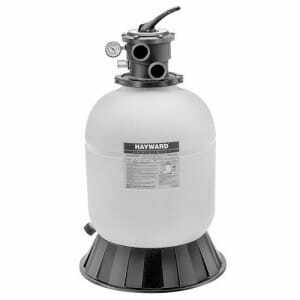 The Hayward EC40AC perflex extended cycle filter is what’s commonly known as a “DE” filter, the precise description is a “diatomaceous earth” or “diatomite powder” filter system. This simply means it uses diatomaceous earth where some filters use sand or paper cartridges to remove unwanted particles from your pool water. The earth is a natural product; it is in fact the fossilized remains of diatoms which are a type of algae. Some people reckon that is the Perfect DE Filter available for cleaning your pool water. Fitting of the Hayward EC40AC Filter is pretty straight forward and can be done in around a half hour, read the instructions first of course and make sure you’ve got everything you need on hand before you start. At least one buyer thought the instructions could have been clearer; he recommended reading them at least a couple of times. Make sure you’ve got all the connectors, hose and unions you need as none are supplied with the filter. You might also need to buy a base unit. As this is only a filter unit you will also need a pump. If you don’t already have one then you should look for a pump with an outlet rating of between 30 to 65 GPM or 114 to 246 LPM. The choice of pump also depends on whether you site the filter above or below the water line of your pool. If you want or need to site the filter above the water line then you should get a self priming centrifugal pump. The Hayward Power-Flo LX Series Pool Pump is ideal and often used for the job. The filter comes with a flow controller to attain the optimum rate of flow. This is easily fitted to the filter with an elbow adapter or union. To make sure you don’t overly reduce the water flow, site the pump and filter as close to the swimming pool as possible and use the minimum amount of hoses and plumbing fittings needed to get the job done. All of the connections on the Hayward EC40AC filter are 1-1/2 “ N.P.T. make sure that you apply plastic pipe sealant or Teflon tape to the joints where needed. Don’t forget to buy your DE, you should be able to get it locally if there’s a pool supplier in your area or get it here. If your location is subject to below freezing temperatures in winter then you will need to drain the filter and store it indoors. If you want to get full enjoyment from your swimming pool then you need to make sure it’s a clean and healthy environment for every one who uses it. You want your family to be safe when they’re having fun. That means making sure that the pool water is free from bacteria, viruses and any bugs or leaves that might find their way into the pool. So you need a Right filter systems. The Intex 2,650 gallon good sand filter pump is exactly what it sounds like, a combination pump and filter. It’s a very low maintenance system which means you get to spend more time enjoying your pool and less time worrying if it’s clean. Especially suitable for above ground pools that are 16 feet or larger and have a water capacity of 5000 gallons or more. 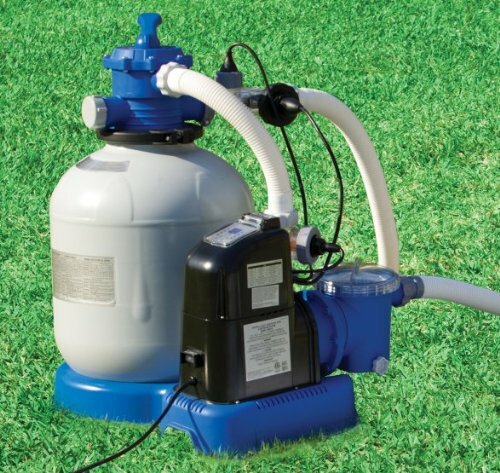 The Intex 2,650 gallon sand filter pump is easy to install as it is designed to hook right up to the existing hose connectors on your Intex pool, no need to buy adapters to make it fit. At around 20 x 22 x 31 inches and weighing around 70 pounds it’s not difficult to handle. When you install and set up your Intex filter pump make sure you follow the instructions to the letter, don’t skip it, Then have to start over. Make sure that the tank is secure and level, if it isn’t you could end up pumping sand through the system which will of course end up in your pool. You will need at least 100 pounds of sand; it needs to be # 20 grade silica sand which should be readily available from local outlets. It will most likely cost you around $20. Also follow the procedure in the owners manual for back washing, this will make sure that any fine sand particles or other impurities are removed before you put the filter into service cleaning your pool. One of the really different things about this particular Intex sand filter pump is the 6 way control valve; it’s probably the best feature too. It gives you a lot of control. Let’s take a look at the 6 different operations or “modes” as Intex calls them. This could be said to be the default position, it’s the mode that your filter valve will be in most of the time, doing what it’s supposed too, filtering your pool water. The water is sucked from the pool, passes through the control valve into the filter tank, and soaks down through the sand leaving any undesirable particles behind. After being cleaned the water passes through the outlet of the control valve and is returned to your pool. This is what you select when you need to remove water from your pool for repairs or maintenance, or if you want to drain your pool for winter. After being drawn from the pool the water bypasses the sand filter and goes straight to the drain waste valve outlet. Again this is exactly what it sounds like; you can pump water from your swimming pool and back into the pool without it passing through the latest filter in the market. This vale setting completely reverses the normal procedure; the water from the pool is pumped into the bottom of the filter tank and is then forced upwards through the sand. This action disturbs any particles and debris in the sand causing them to float to the top and then out through the drain outlet. You will lose some of the water from your pool but it cleans your sand filter. This is usually done after using the back wash mode; it settles and levels the newly cleaned sand. 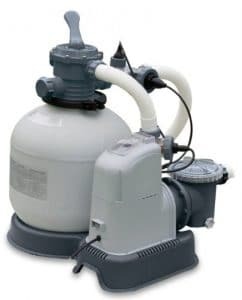 If you need to remove your pool or you just want to shut it down for the winter or for some reason remove or store you filter/pump system then you would select the closed mode, it then completely stops all water flow, so you need to ensure you shut down the pump first to avoid damage. WOW, what an improvement! 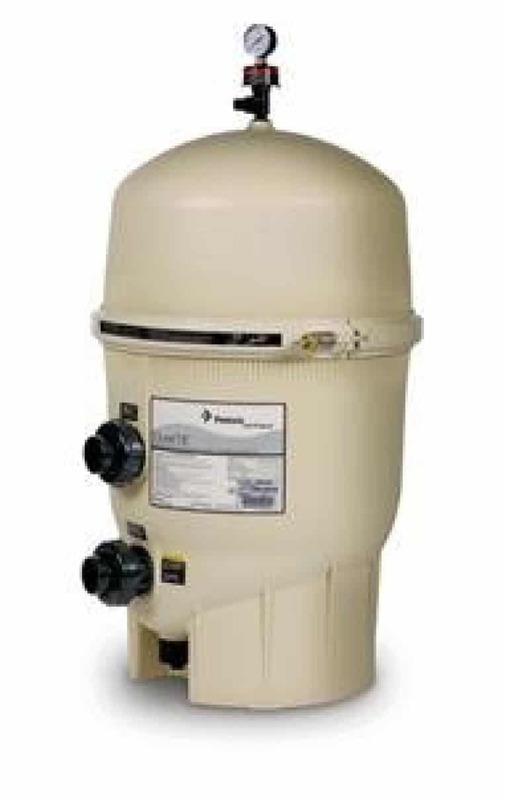 I’m replacing my 2000 gal/hr pump with this sand filter. IT’S GREAT! Next to pool, best investment yet! The clear water you see in the swimming pools is a result of the pool filter. Pool filter separates the debris and particles from water and the filtered water is sent back to the pool. Not replacing the filter in a timely manner will prove harmful to the swimmer’s health and not maintaining it can strain the pool pump. Therefore, filter types require maintenance and careful handling for long lasting results. With little knowledge and research, you can save money and buy the best pool filter that can last long and work efficiently. Sand filter, cartridge filters and diatomaceous earth (DE) filters are the three main types of pool filters. Each one of them has its own advantages and disadvantages that one should consider before buying or replacing a pool filter. You need to understand the working of each filter type to decide the filter you should install. 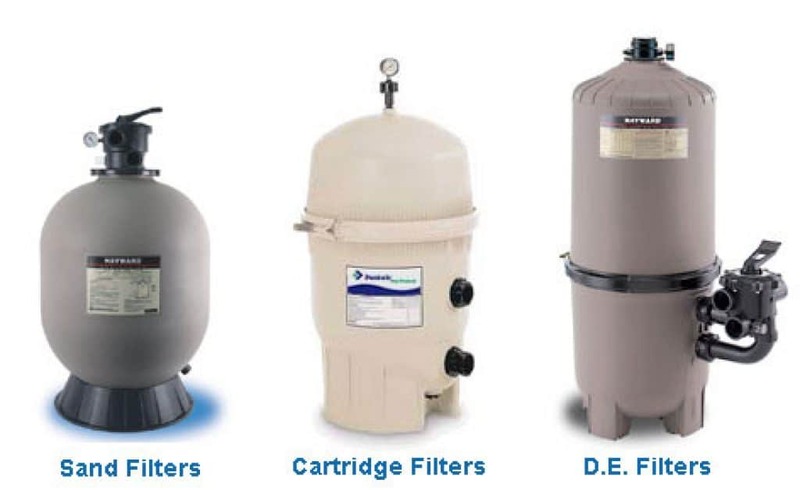 While the sand filters are affordable, DE filters are expensive. Likewise, sand filters cannot sift microscopic particles, whereas DE filters can sift contaminants as small as 1 micron. The main difference among them is the performance over time, price and maintenance. 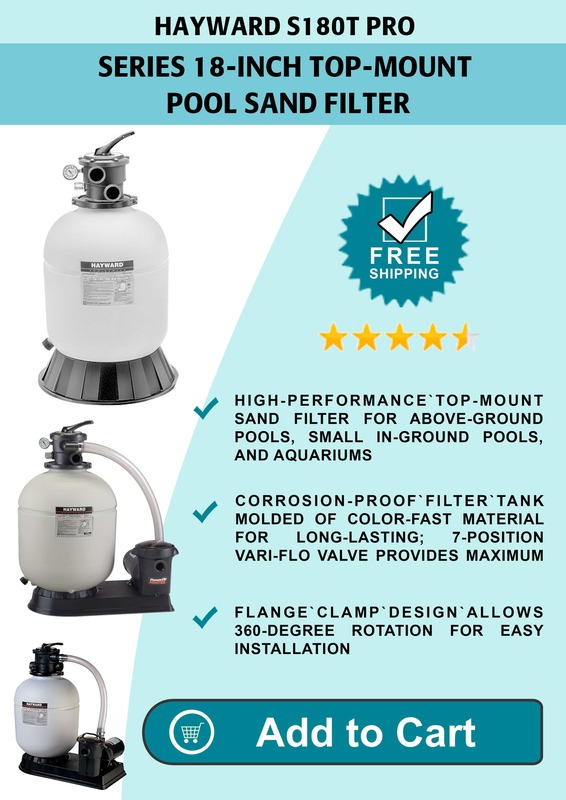 Experts recommend buying large pool sand filter because it’s worth in the long run. This is the oldest and the most commonly used filter in pools. In this kind of filter, sand is used to trap debris. There is a tank and a specific amount of sand depending on the size of the tank. This is a specific kind of sand used for filtration in pools. The tank is filled with the water and the water passes through it. During this process the sand catches debris and the dirt remains in the tank until the entire system is backwashed. The filtered water is sent back to the pool. Depending on the swim season, the sand inside needs to be replaced in three to five years. Out of all the filter systems, it is the most affordable filter system. It could be attributed to the fact that the filter lasts four to ten years. It depends on the swim season and the maintenance of the pool. As it utilizes lower pump pressure, it reduces energy costs. In comparison with other filter systems, it is simple to maintain. It causes less wear and tear on pool pump. Besides, due to the bigger surface area, it cleans more dirt particles. Due to regular backwashing of the filter system, it wastes a lot of water and pool chemicals. Additionally, it is unable to catch particles less than 20 microns. These kinds of filters come in different varieties such as single element cartridge pool filters and multi-element cartridge filters. Depending on the size of the pool, the cartridges come in small, medium and large sizes. The pool water is passed through a fabric-like medium, which has pleats that results in trapping of the debris by the cartridge. 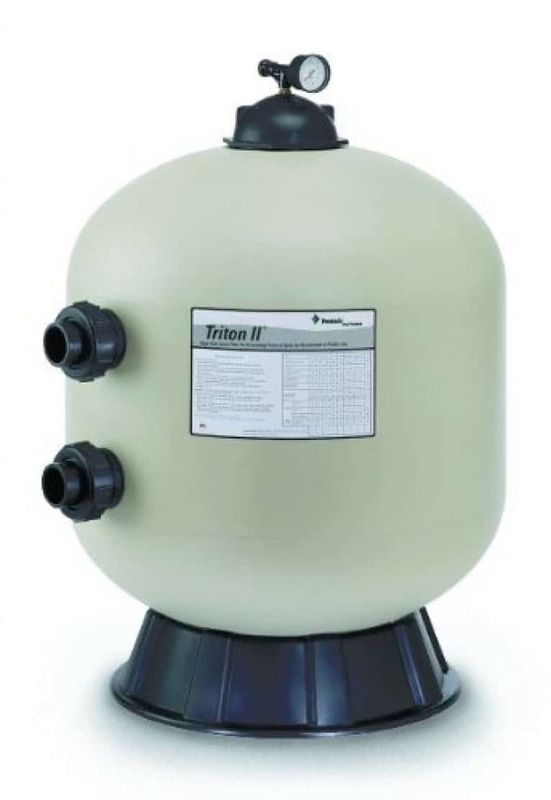 Comparatively, owing to the initial price of a cartridge filter, they are expensive than the sand filters. However, they are less expensive than a DE filtration system. In order to clean the cartridge, it needs to be taken off the filter housing. By spraying water on it, it is cleaned. Generally, the cartridge can last for two to five years. Unlike sand filters, it does not waste expensive pool chemicals. It has the ability to filter particles as small as 10 microns which sand filters fail to accomplish. The filter cleaning is easy and faster which can be done by anyone at home. The pleated cartridge material helps in increasing the surface area of the medium. This results in handling a higher flow of water by the filter. Though the cartridge replacement, which varies according to the usage of the pool, is required in two to five years, it becomes expensive. Technologically, these are the most advanced pool filters available. It is very similar to its working as a sand filter with the exception of filter media. There is a set of grids in the DE pool filter and these grids are coated with a DE powder. When the water passes through these grids, they catch microscopic microns as small as 1 to 3 in size. This is the secret of its efficiency which makes it attractive and expensive too. Just like a sand filter, it needs to be backwashed that can cause DE powder to wash away. Therefore, the DE filters need to be recharged with DE powder after backwashing. If health is your top priority – which everyone has – you should definitely opt for it. These are highly efficient filters that can trap finer and smaller particles. This leads to the better quality of water which is clearer and safer for the swimmers. Though it requires recharging with DE powder, made of crushed seashells and the external silica secretions of sea creatures called diatoms, the powder is not expensive. In addition, it is not difficult to recharge a DE filter and it can be conveniently done by hand at home. The initial cost of installing is very high that makes it most expensive out of all the available filters. A filter in the pool is same as the kidneys in a human body. A pool filter filters out the impurities and supplies clean water to the pool. A filter is fitted into the pool’s plumbing system. The water of the pool is passed through the filter, which may be a sand, cartridge or a DE filter, which traps debris and fine particles and returns the clean water to the pool. As long as the filter is on, the water runs in a circular fashion. This way it helps to keep the pool water clean and hygienic. Depending on certain factors, the filter may operate for 6 to 12 hours a day. Now that you know the different type of filters, you would be able to zero in on the one that best fits your need and pocket. If you hire a professional, they would go for DE filters due to their efficiency to clean faster and better than any other filter. The cartridge is the middle-of-the-road solution that does not waste water like sand filters which are cheap. The bigger is better when it comes to filter size. If your pool’s biggest problem is dead algae, you will need a bigger size. On the contrary, if you are not worried about algae then any right size of filter will work. What’s The Best Pool Filter Type For Your Pool? It depends on the pool owner and pool needs or requirements. If maintained and cared, all three filters work well. However, if you want a low maintenance filter, you should opt for a cartridge filter. They are easy to clean and monitor. However, if your pool is used extensively for long hours, you need a filter that lasts long and is strong. The solution lies in sand filters which are used in public pools and larger pools. Lastly, if you are the one who wants the pool to be clean and the water to be the cleanest, DE filters are for you. Though they are expensive, they catch the smallest particle and keep water clear and swimmers healthy. Why Large Pool Filters Are Better For The Environment? We cannot ignore environment just for our comfort and leisure. The environment cannot be sacrificed at the cost of human comfort. Therefore, we need filters that are eco-friendly and serve the purpose they are meant for. Though larger pool filters need to be backwashed, but not frequently. This, in turn, saves precious water and decreases DE powder discharge which gets washed away every time filter is washed. Lower pressure and higher flow can be achieved by using oversized filters, which result in a higher turnover rate. They help to stop poor water conditions and require more sanitizing pool chemicals. You may have to use a small energy saving pool pump in case of larger pool filters. Additionally, oversized filters operate under less pressure and thus your pool pump has to work less. Consequently, this reduces the amperage usage. We can pump less water and use fewer chemicals to treat the water if a larger filter is used. Pool pump, the heart of any pool, plays an important part in sizing filter to a swimming pool. Firstly, you need to know the flow rate that is measured in GPM, gallons per minute. The pump will determine the actual flow rate of your system. You need to keep in mind the flow dynamics, calculated as the resistance to flow, of your installation. It is measured in total head pressure. You can safely assume, for most swimming pools, 30 feet of head pressure. Then you need to look up the pump flow rates for your model and size pump operating at 30 feet of head resistance to flow. This will give you exactly what your pump will actually provide once installed on your pool. There is a maximum amount of water flow every pool filter can handle. Too much flow has the potential to damage every part of the filter. Let’s take an example of 24” XYZ sand filter that has 62 GPM maximum designed flow rate. This translates to 3720 gallons/ hour, 29760 every 8 hours and 89280 gallons every 24 hours. Here, the turnover rate is roughly 3 times the pool volume we can take the 89280 gallons/ 24 hours. Divide it by 3 to determine the maximum pool volume that the pool filter can handle. The result is 29760 gallons that means this particular filter can filter pools up to 30,000 gallons operating at its maximum capacity. Though installing pool filter is a simple process, it needs to be done carefully to avoid any damage or incorrect installation which may cause voiding of warranty. Always consult manufacturer’s manual should you work with the unfamiliar product. The equipment pad should always be a flat, level concrete slab. Do not install a filter on wood since it may decay over time and alter the position of the unit. Here is one more important thing to keep in mind. Make sure the filter is located as close to the pool as possible. The filter should have sufficient drainage and enough room for servicing and maintenance, should the need arise. To get the most of the water flow efficiency in the circulation system, plumbing should be installed with the shortest lines and less number of fittings. The pump runs on electricity which is why filter should touch the ground and fixed by a professional electrician. Additionally, according to local and national electric codes, a professional must hook up the electrical wiring and motor. After installing the filter on the pad, check if all of the plumbing connections are set and the unit is stable and grounded. Now, it is time to put the circulation system into full operation. As the filter separates finer particles, debris, dead algae, the quality of water improves phenomenally. The sparkling water you see in your pool is a result of good filtration system that is working in perfect harmony with other components. Cleaner water means less contaminant that leads to great health benefits. No matter what kind of filter you use in your pool, it will clean the water to the smallest microns possible as per its filter type. Pool filters work well, when chemicals such as chlorine is added which helps in removing and killing bacterial organisms that cannot be seen with naked eyes. As the pool filter improves the water quality, it will lead to cleaner water which is a must for the health of swimmers and bathers. Interestingly, the swimmers are the main source of contaminants and you need to save them from it. A good and well-maintained water filter will keep filtering out dirt and debris and circulating water that will keep the microorganisms away. An effective filtration system requires less use of chemicals. This, in turn, results in preventing red eyes and skin irritation. Some people are allergic to chlorine and an effective filter is a solution for it. Using the right kind of filter can really benefit the environment we live in. Unlike sand and DE filters, cartridge filters do not require backwashing and thus help in saving thousands of liters of water every year. Larger filters also play an important role in saving energy costs and thus help in preventing pollution caused due to generating the power. Additionally, an oversized pump requires less water and usage of fewer chemicals to treat the water. The fewer the chemicals the better effect on the natural environment. Filters were introduced to save water to prevent recharging of pool water and this leads to saving electricity and water both. The pool filter’s main task is to clean and circulate the water so that the water could be saved. In absence of filter, we have to replace the pool water every day which means wastage of precious water which could have been used for the more important task. As chemicals are generally used in swimming pool waters, the used water can only be drained in sewer and could not be used for any other purpose such as irrigation. As filtered water helps in reusing the water, a swimming pool owner ends up saving thousands of liters of water each month. Some filters require regular backwashing that wastes water, chemicals and heat. Therefore, you need to pump more water, heat it and again add the chemicals in the pool. This means a filter that does not require frequent backwashing – DE filters – will save you considerably on power bills. Therefore, a sand filter may be affordable but in the long term, it may not prove economical. You will have to spend more on pumping water into the pool. It is not just the kind of filter but also the size of the filter that can help you save money on electricity. A larger filter with more surface area filters faster and thus reduces power bills. Now that you know how the pool filters work, what the different kind of filters are along with their advantage and disadvantages, it would be fairly easy to focus on the right filter you deem fit for your pool. This information will not only help you to zero in on the best but also bargain with the seller as an expert who has pool terminology at his/ her fingers’ tips. Based on your pool type and size, you should buy a filter that not only saves you money but also takes care of the environment. So the next time you replace or buy a pool filter, keep in mind all the above factors that will help you in being a smart and an informed buyer.